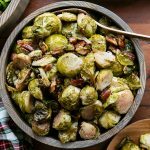 A recipe for Maple Syrup Roasted Brussels Sprouts with toasted pecans – my favorite vegan holiday side dish! They can convert even a diehard veggie hater. Toss the brussels sprouts, pecans, olive oil, salt and pepper together. Once coated in oil, spread into a 9- by 13-inch baking dish or cooking sheet to roast. You may want to line your sheet tray with foil for easier cleanup. Bake at 375 degrees Fahrenheit. Bake for 30 minutes, stirring halfway, to even out the browning. Stir in the maple syrup. Continue to roast the brussels sprouts for about 15 more minutes, or until they are fork tender (about 45 minutes total).